Well excuse me mister thought I made a wrong turn but I didn't. WUDU will be missing this event and it makes me sad. But that being said we will see you in Charlotte and INDY. Good luck fellas!! Road ATL is one of my favorite tracks! If I remember correctly, for the last couple of years the firs test session was a no passing session. This would be the ideal time to get them on the track. Their first time in the 11-12 section is going to be a true pucker moment if they have never driven that track. They probably dont want to be more than 60% on their first couple of laps. make sure they have studied up on what the flags mean. I think Bill posted a thread on that so use the search function to find it. Do they have any track experience at all? HPDE? The last race at RA was point by passing only. The problem is that newer drivers who have never driven on a track before go ~60% and everyone wants to go much faster so passing without point byes happens a ton. It's definitely information overload to learn a new car that you've never driven without ever driving on a track while at the same time knowing to point by all of the other cars. They should read the rules. there are a lot of things in there that all racers need to know. Not just car building. I’m guessing here but I think the lap average of the field is about 10 seconds per lap faster than the “early” days, with half of that because the cars are faster and half of that because the talent level is higher (many of the same people, but substantially more experienced). That is a notable difference in speed (and the number of cars that will blow by a complete newbie per lap). It is very sensible to try to get some track laps in before the green these days. Will Tech be open Thursday night? You show every sign of being a Virginia Tech grad. 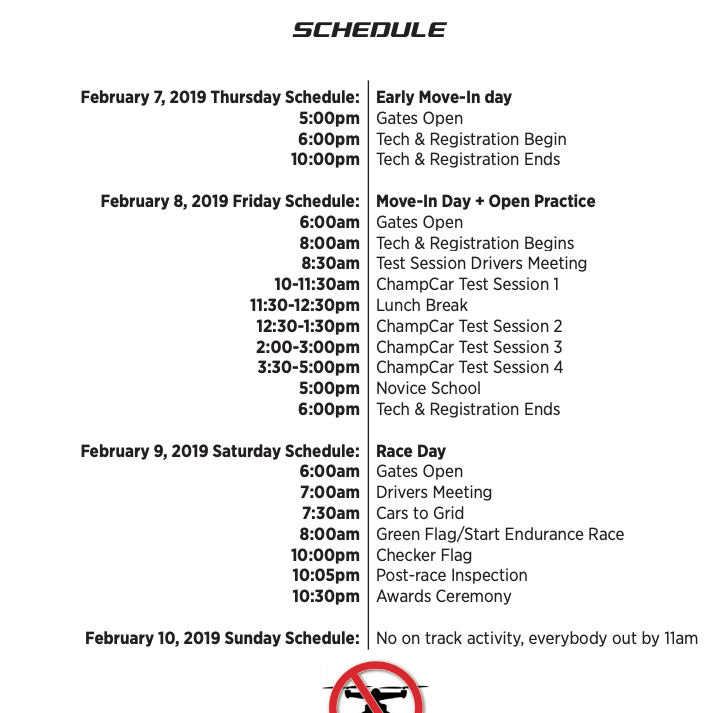 Since the beginning of time, ChampCar has made event supplementals that list the event schedule. I don't know, this method seemed to be a lot less work for him, and he still got the answer. Maybe you're the VT grad, Bill. Maybe you're the VT grad, Bill. Still one of this biggest thrills in racing for me and I have a MUCH better finishing record from tracks I've never seen until green than places I've driven for years. Are you taking the E30 up there for more of Mark's magic?